Happy Bastille Day! July 14th marks the French national holiday of Bastille Day, celebrating and remembering the anniversary of the storming of the Bastille prison back in 1789. Thinking of France made me remember the gorgeously decorated table top designs at the NACE competition last month. 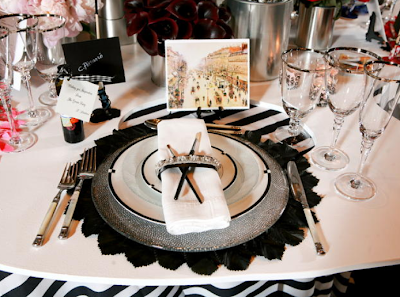 My team's theme was Tokyo, and 4 other amazing planners dressed and designed their tablescapes with Paris in mind. 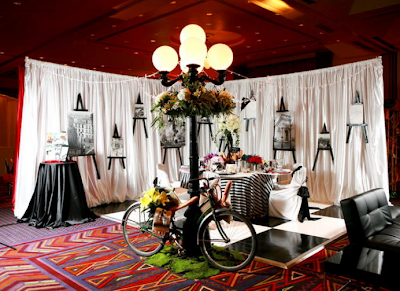 I was so inspired by the "City of Lights" table designed by Vivian Ullman of Environs Events. 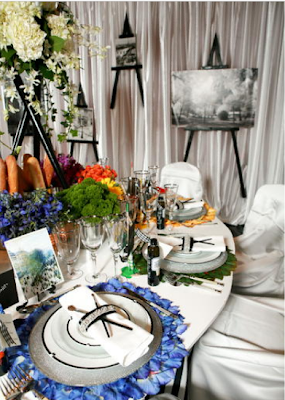 She mixed in classic Parisian themes with an artistic twist to create an intimate feel of a sidewalk cafe. The sidewalk bistros of Paris came to life with this table design: Makes me wish I was sitting at an actual outside cafe! The paintbrush table settings were so clever! Amazing way of incorporating the influential French art scene. Beautiful colors against the black and white design. 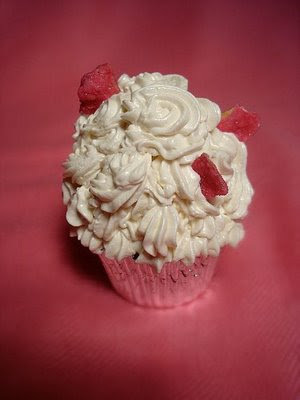 The blue really pops out and reminds me of the serene French countryside.